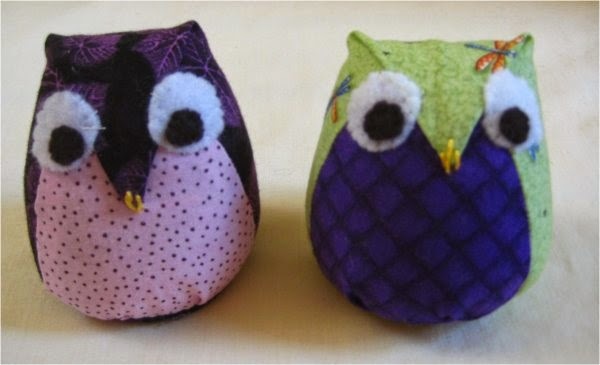 There is a very easy tutorial for these stuffed owls at Moon Stitches ... the tutorial is presented in picture format, spread out over the subsequent pages. Also, do a Google/Images search for "tutowlrial" and you'll see all SORTS of simply adorable samples! stitch by hand, if you wanted a portable project when you are on the go. They are great little projects to do whilst you are watching a TV show. 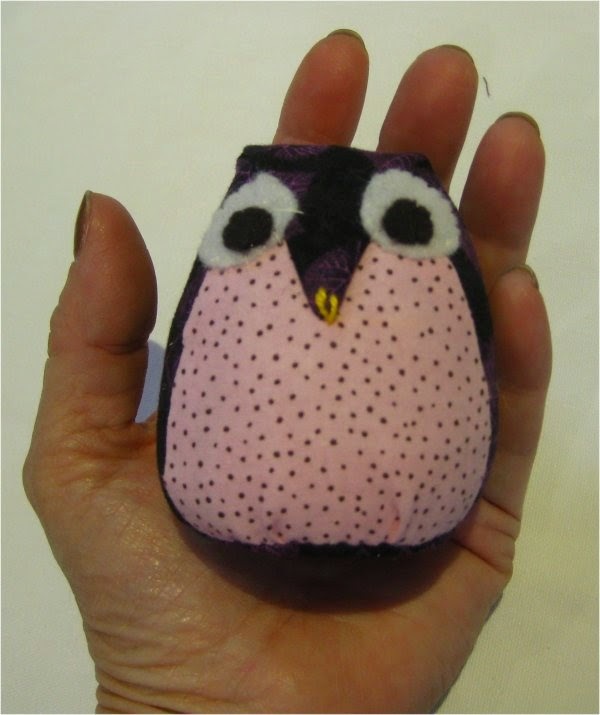 Allow yourself the freedom to choose WILD fabric for your owls; they won't mind. :-) If you think far enough ahead, you could fussy cut the circles that are used as the owl's base. I didn't consider that when I was cutting my fabric. And speaking of the base, I used cardboard for mine. Be aware that whatever you do use as the "stiffener", stays inside the circle of fabric. Because I used cardboard, these little owls aren't washable ... you might think of using something that won't be affected by water if you think your owls are going to be in an environment that would warrant them being cleaned. 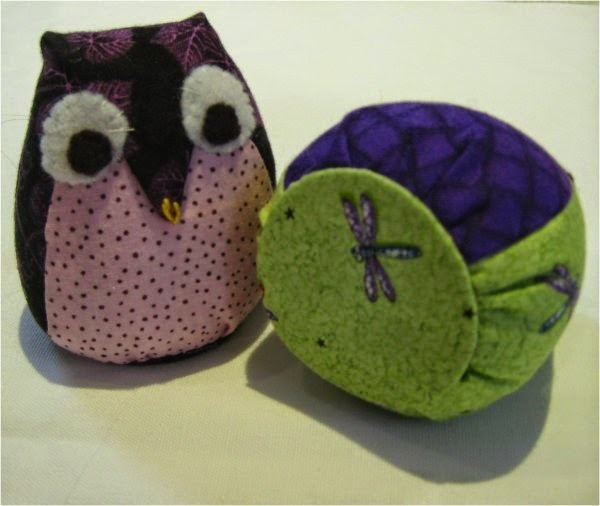 I used felt circles for the eyes, since these owls are going to be sent to two young girls (ages 2 and 4). Buttons would also be a great item to use for eyes .. but not if young children are the recipients. When you use buttons, be aware of the direction the final stitches through the buttonholes are placed ... you can really alter the look of your owl, depending on whether the thread is horizontal, vertical, diagonal or even crossed! If you were so inclined, you could fully embroider the eyes, use smaller circles of appliqued fabric or even paint them on the fabric. If you position the eyes UNDER the "nose" flap, then the owls will have a stern look to them. Again, do take the time to do a Google/Image search with the keyword "tutowlrial" ... you'll see lots and lots of very clever ideas to spark your imagination! 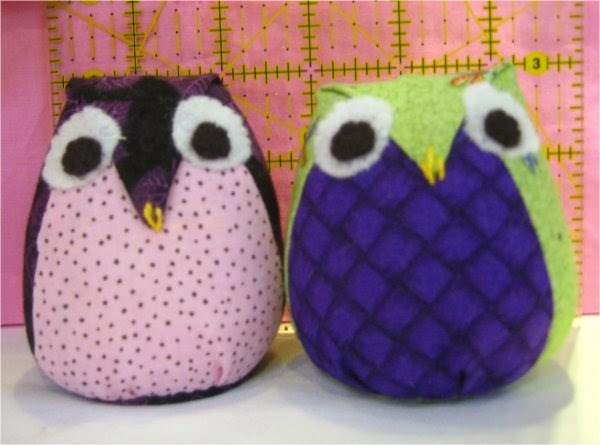 If you use the pattern "as-is", the owls will be about 3" high. They fit comfortably in the palm of my hand. 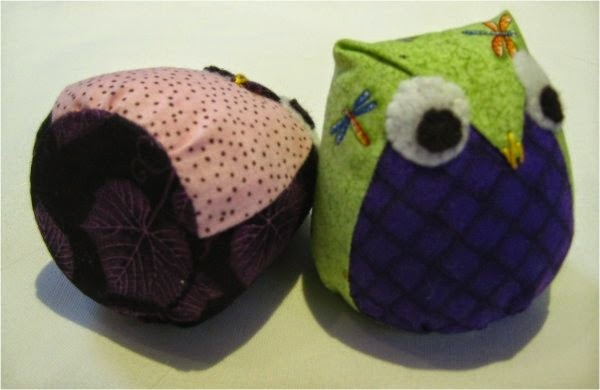 Once you see how the pattern pieces fit together, you can scale the pieces up or down to create a larger or smaller owl. 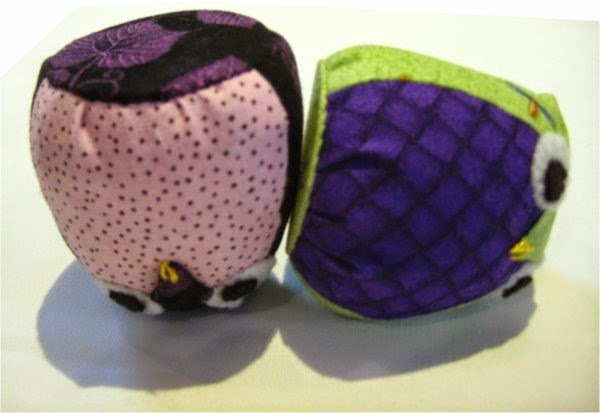 With different sizes, you could have an entire family of owls! These little guys are just sooooooooooooooooooooooooooo adorable. I'm putting one into the Bendy Bags that I blogged about earlier. I've had my quilting projects on hiatus while I worked on some sewing projects. With most zipper bags, the zipper goes straight across the top of the bag. Not this one. 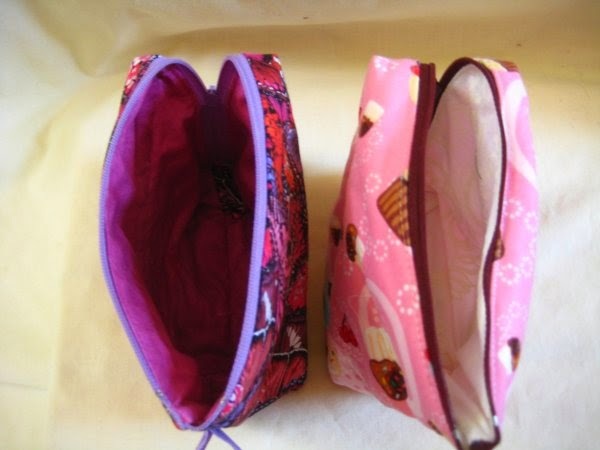 The name "Bendy Bag" comes from the way the zipper bends at the corner to continue part way down the side. exterior, so I don't care for exposed seams inside. Because I was thinking that the fabric that came with the pattern as the "good" fabric, I wanted to practice with some other fabric first ... as I wanted to see if I could manipulate the directions so I didn't have the exposed seams. 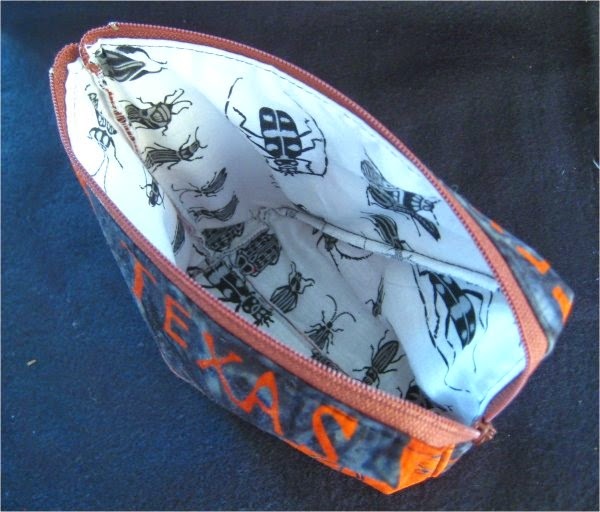 My first attempt was using leftover Texas longhorn fabric as the exterior and bugs as the interior. It came out cute ... but my attempts to completely contain the seam allowances didn't work out. I concluded that with their design, you just can't put all the seam allowances so they are hidden. 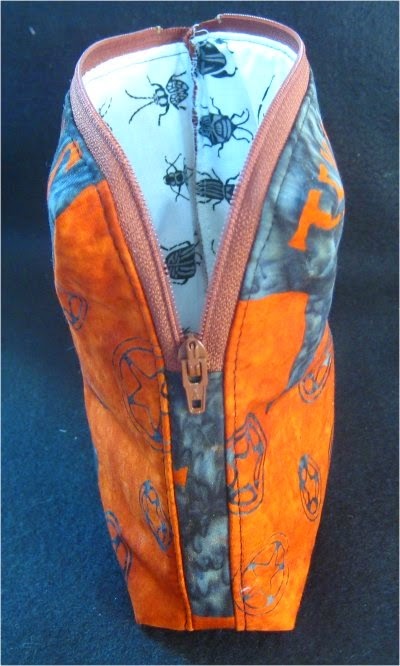 You use an overly-long zipper so that you can use the "excess" as a loop/handle on the side of the bag. 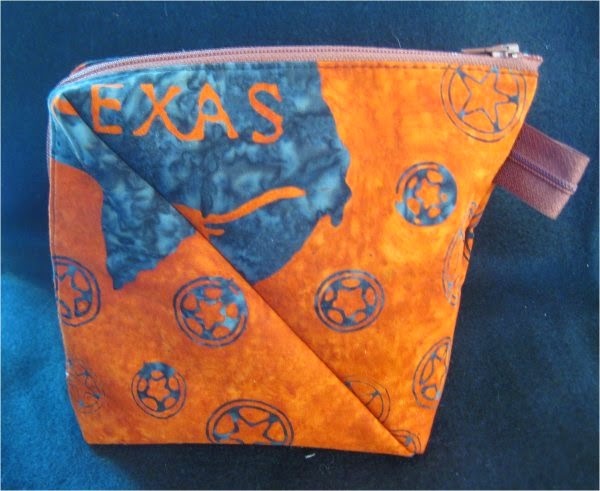 I ended up mailing this bag to a Texas quilting friend of mine ... but ... and this is why I absolutely HATE mailing valuable stuff ... the post office managed to mislay the package. It never arrived. The post office at my end hasn't a clue where the package went or where it is. Doggone shame. I made two other Bendy Bags, this time following the directions! The interior exposed seams are neatly trimmed and overcast (with a zig-zag stitch). For one of the bags, I used matching bias binding to cover up the seam, but that really did add just a whole bunch of time to the construction process. 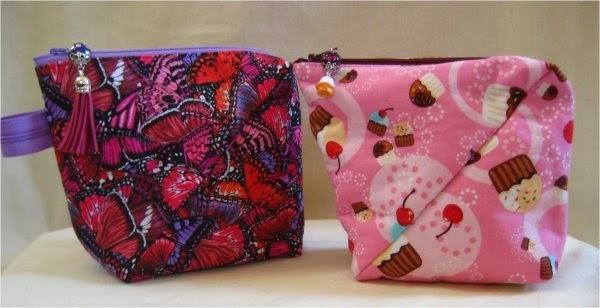 The butterfly fabric was what came with the pattern, along with the hot pink lining and zipper. The cupcake fabric was specifically chosen because my youngest daughter is One Terrific Cook. She can bake and cook *anything*. Nothing phases her (unlike me, who needs a precise recipe). I thought she'd get a kick out of the cupcake motif. Ah, but my mother's intuition was 5 degrees off-center this time. She didn't care for it. While I will admit to being disappointed, I *am* very glad that we are able to be honest with each other so that she didn't feel obligated to accept it when she truly didn't care for it. She did mention that one of her friends has two young daughters (ages 2 and 4) and perhaps they might be recipients? Bingo! Done! There's nothing I like more than making stuff for little girls. Which got me thinking ... even though I don't *know* these little girls nor their Mom, I couldn't "just" give them a Bendy Bag. Oh no ... my mind was all awhirl with a set of goodies .... a small stuffed owl to go in the bags, a crayon/coloring book caddy and a ruffled tote bag to put everything into. So, off I went ... deferring my quilting projects for this newest sewing project! More pictures and descriptions of the other items in another blog entry!